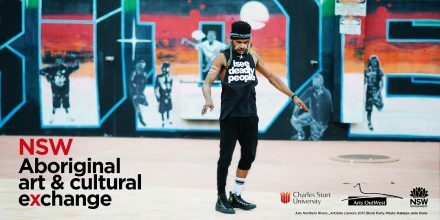 Create NSW and Arts OutWest are hosting the inaugural NSW Aboriginal Arts and Cultural Exchange at Bathurst from 31 October to 1 November 2018. The Exchange will highlight the creative innovation taking place across NSW and discuss ways to build capacity and strengthen networks that will enrich and grow the Aboriginal Arts, Screen and Culture sector. The Exchange includes a Welcome to Country with Bathurst Wiradyuri Aboriginal Community Elders.